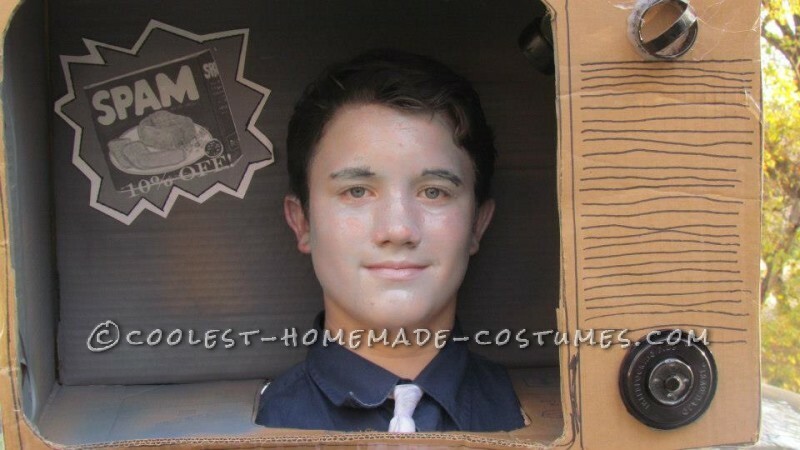 My son is the product of a quick-witted father and a fairly creative mom, and unlike his Halloween costume, he typically lives in the realm outside the box. His Halloween costumes evolve from spontaneous spurts of ingenuity, blasting out, it seems, with the Halloween haul of one year until the nick-of-time-October of the next. From the best that I can gather, ideas ricochet from ear to ear until time runs out, and a decision must be made. There is not enough Halloween in one kids’ lifetime to accommodate the number of costumes that my kid my wants to wear. To get the most for our mini-money, we sometimes sneak a two-fer. An animate object. Hmph, I think. He can’t get enough of three-piece suits and fat ties he finds in the” polyester and more” section of the local auxiliary shop. My work as a mother is done! I am out of the business! I sadly envision my role as mom, fast-forward to oblivion. HMMMMMM? Wink, Wink, secret mommy satisfaction. Super-simple, I may not be necessary in this process, but . . .
“A weatherman from the 1950s.” Logically. His head doesn’t fit into an LCD flat screen. “That’s my boy!” We had reached a consensus. He came up with something unique, not everybody wants to be an appliance, after all. 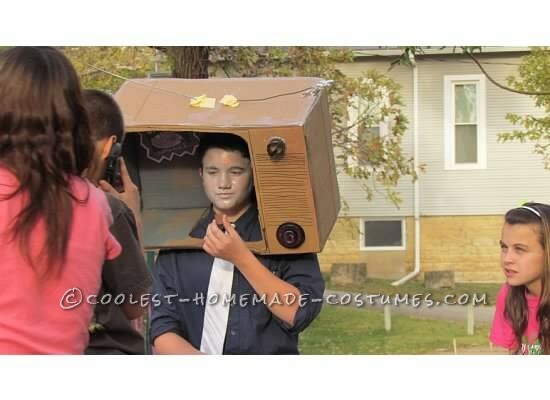 And this costume allows Mom to take a “supporting role,” and let her boy be the star of the show. Of course in the end, the weatherman turned into just a guy in a tv with a SPAM advertisement, the oldest item of which my son could possibly conceive, and as an added bonus, a pork product—the funniest thing for a pre-teen, apparently. This one had to be the easiest ever. Cardboard box, check. Cut out a hole, check. Head, if that ego fits, wear it, I guess. Lastly, a cheapo SPAM ad he created on his computer, complete with a 10% discount for anyone interested in partaking. And so it began. The only challenge was to scavenge about for the dials. My first thought was: use one from the stove!, then common sense kicked in, and I realized I needed that in the future for our family’s survival. 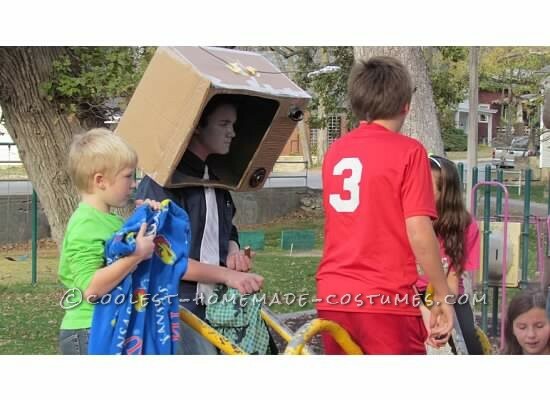 Just because it leaves the house on a costume doesn’t mean it will come back. We settled on a biscuit cutter. Who makes biscuits, anyway? . . .And a plastic storage container lid, most of ours are without their companions, and finally, a tea light for dimension hammered on with a roofing nail and of course a little bead of hot glue. We don’t actually know what that second dial is for . . . but nobody else does either, so we figured we were safe. We spray painted them all black, because that is just what we do when we want our weird stuff to blend together. We used a little bit of wire for antenna because, from my recollection, not much was visible on a tv without them, and to top off the antenna, a little aluminum foil seemed appropriate. My son ran a Sharpie out of ink drawing his details on the tv, and that was that. On Halloween, we had last minute man-details to address. My blond boy turned black-haired for the black-and-white image. He threw on a tie and button down shirt, and we used gray Halloween face paint, with a little mascara-painted brows to capture the 50’s screen look. Ta-da! Another success! I would say the cost was zero. The only thing better than having the best costume on the block is having the best free costume on the block! Right?